Did you see our new 2019 Conference page? It has all the details you need about this year’s Annual Weekend Conference. Read about the beautiful DeSales campus, travel, lodging, and all the fun activities and workshops planned. Take advantage of the Early Bird Registration period and save $20 when you register by March 30th! We’re all registered up to do outreach at the ASAM, NCAD, and NAADAC national conferences in 2019. 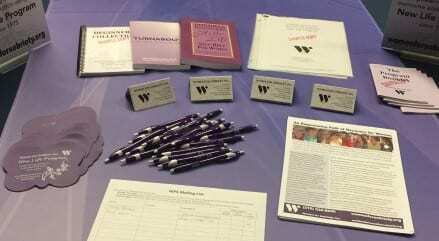 These are great opportunities to multiply our reach by educating treatment professionals about WFS. As a result of last year’s major outreach effort at NAADAC, we have had numerous agencies start offering the New Life Program as part of their care. This week’s photo is a table that I staffed at the Greater Philadelphia Area Counseling Association Trauma Symposium last weekend. They donated the space FREE – thanks GPACA! I was able to make some great connections with local mental health and chemical dependency treatment providers. We had a Board of Directors meeting last week. We passed the new Document Retention and Destruction Policy – and you thought your job was boring! Now I am only half kidding, because sometimes the nitty-gritty work of managing a charitable organization can be really boring. However, all this boring behind-the-scenes stuff is important to making sure that we have an ethical organization with sound business practices. This helps us ensure that we will be around for a good long time. It also helps ensure that we are spending your donated funds where they really count – empowering women to overcome addiction! Other boring stuff I’m working on includes continued exploration of a new CRM software solution. This will allow us to focus more of our organizational time and energy on program development and volunteer empowerment. So even though it isn’t exciting now, it will be a great thing in the long run. Now speaking of fundraising, if you aren’t involved on our WFS Online message boards, then you have been missing out on the exciting preparations for this year’s Teddy Bear Challenge. Online member BunnyH is practicing Statement 12 and has taken charge of this annual fundraiser with gusto! She has been sending hand-sewn teddy bears across North America. Volunteers will be stuffing, accessorizing, photographing, and naming the bears to prepare them for adoption. Well that’s it for this week, my competent friends. See you soon!